I’m not going to pretend that this post is anything more than a runway fashion show of the botanical kind. What follows is a shameless and giddy celebration of the the bounty of blooming beauty that is early spring in my Austin, Texas, zone 8b, garden. 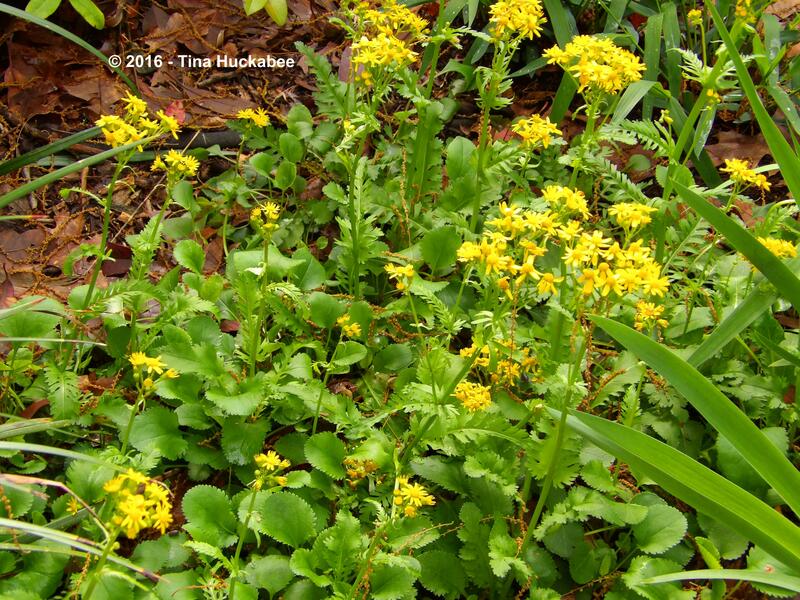 Golden Groundsel, Packera obovata, hit its flowering stride since last profiled for its beautiful foliage a few weeks ago. 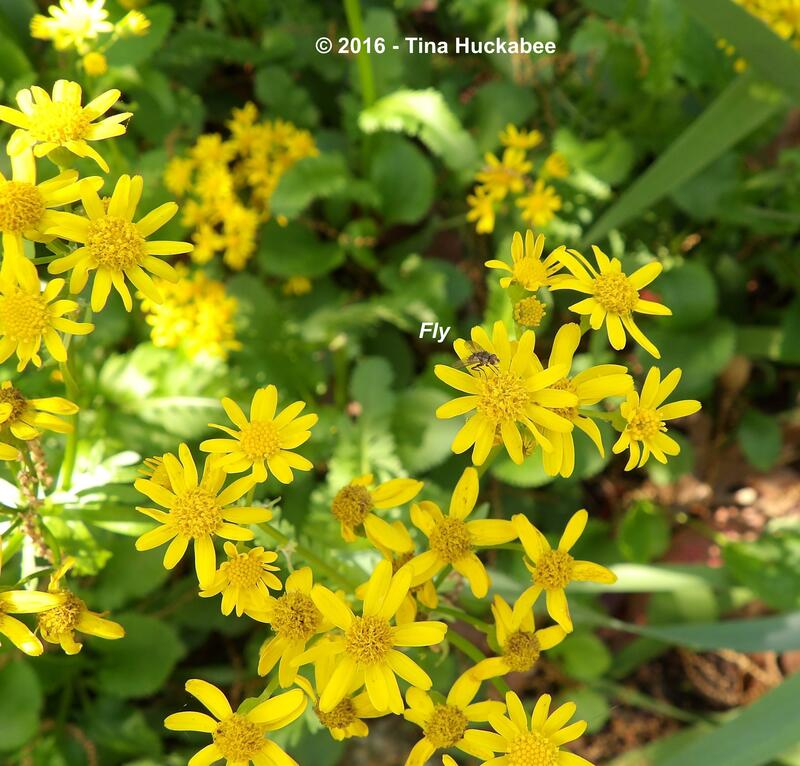 I’m not thrilled when a fly makes its way into my kitchen, but am happy to see it sipping the sweet stuff from the Golden Groundsel. 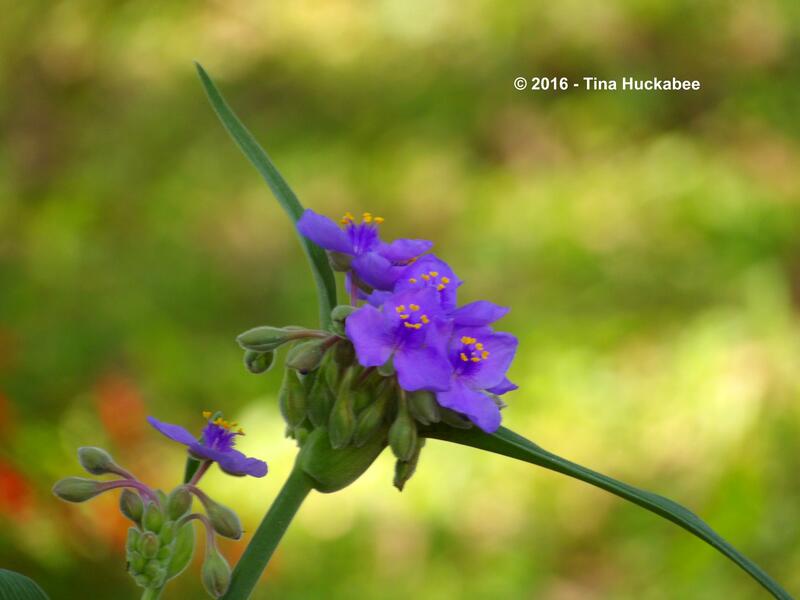 Spiderwort, Tradescantia, plants are strutting their flower-power and keeping the honeybees busy. 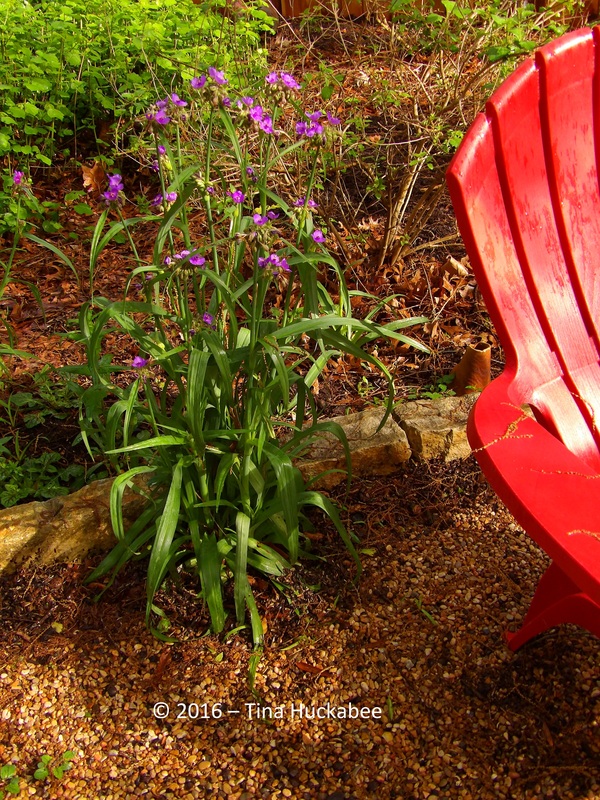 This Giant Spiderwort keeps company with garden furniture. 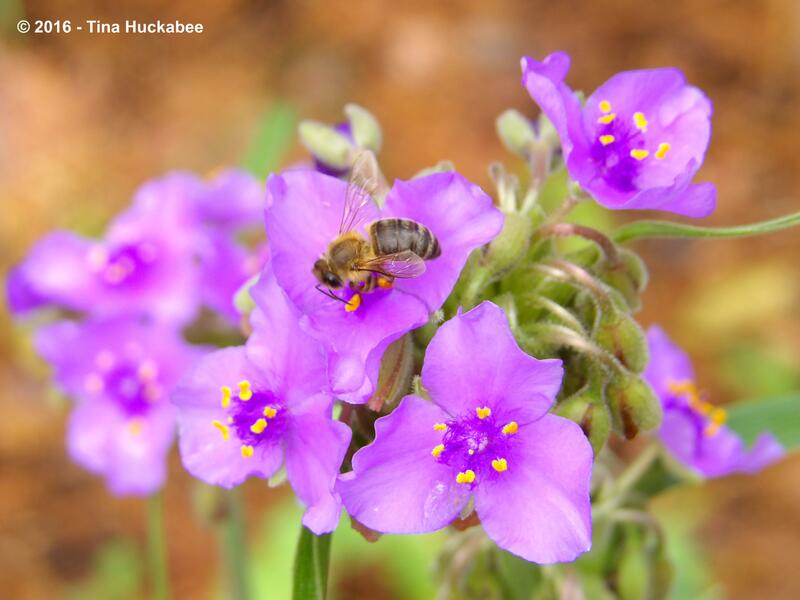 The many Spiderwort clumps my garden enjoy some variability in size and coloration and I suspect that there’s more than one species growing and cross-mingling through the seasons. …are surrounded by tiny native metallic bees, which I can only manage a vague photograph of. 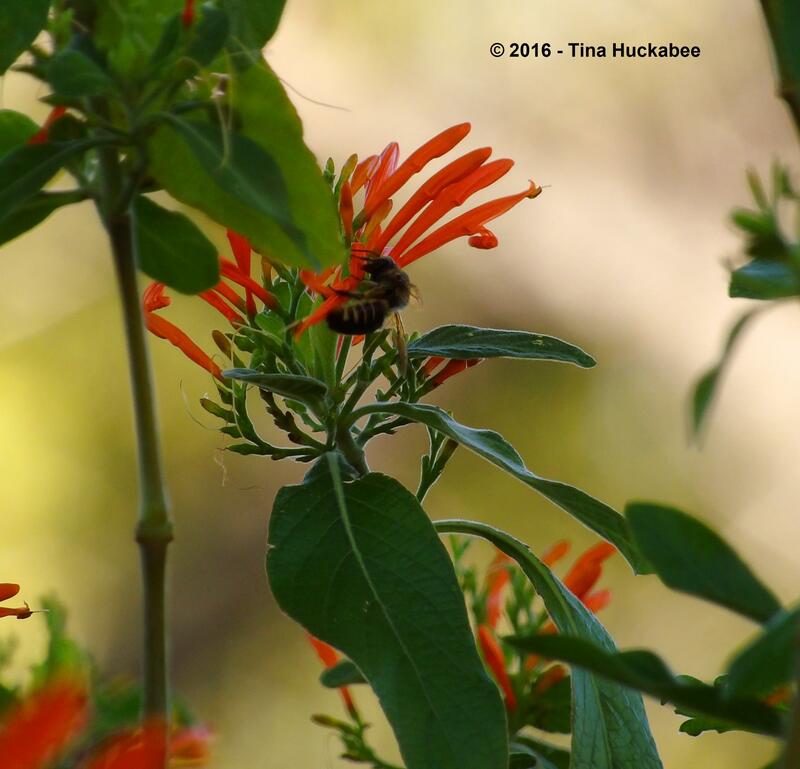 Actually, that’s not really true, but you’ll have to wait until my own Wildlife Wednesday on April 6th to see some slightly better photos of one of the stunningly gorgeous and fast-flying metallic wild bees. This Coral Honeysuckle bloom cluster and the not-quite-open Spiderwort look like they’re trying to reach one another for a smooch. Well, it is spring, you know–the season of love! 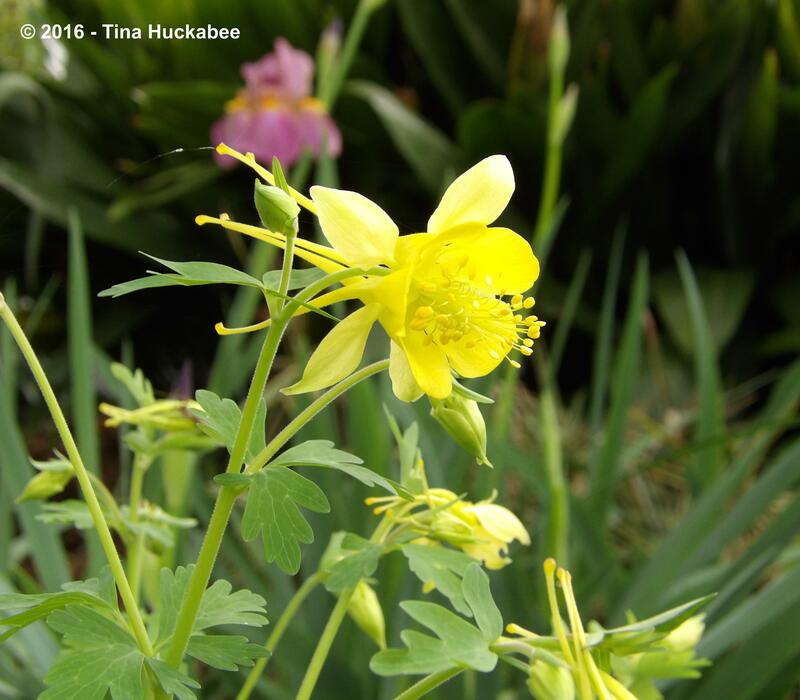 Yellow Columbine with blooming Iris. …and the hybrid between A. chrysantha and A. canadensis, pose beautifully and are available for nectaring, too–if you possess the right proboscis, that is. Hybrid Columbine with backdrop of orange blooming Mexican Honeysuckle and unopened Iris. Hybrid Columbine with not yet in bloom day lilies and Yarrow. 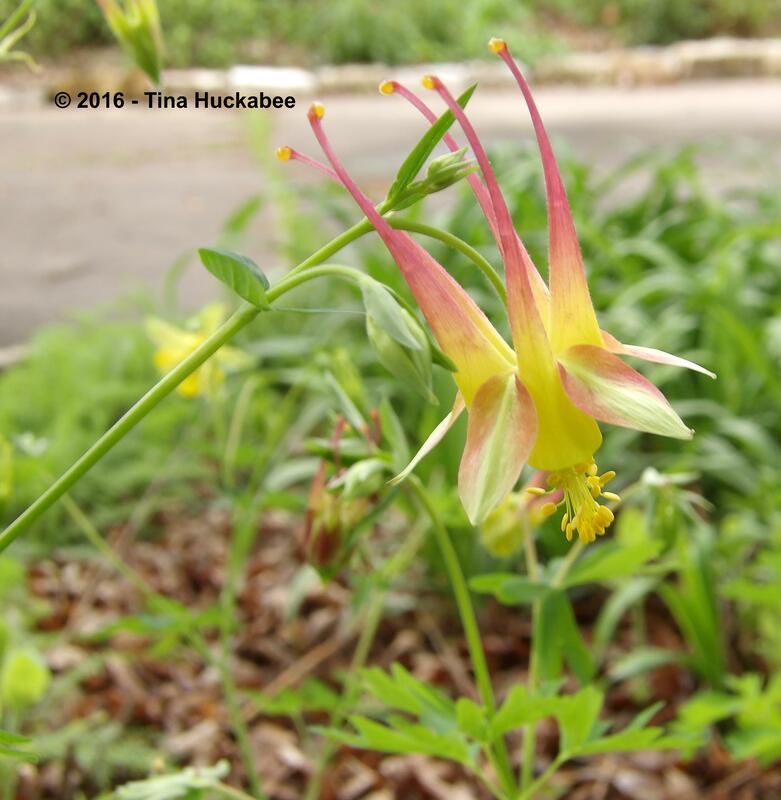 The A. canadensis is a smaller, mostly brick-red columbine. But when cross-pollination occurs, the flower of the hybrid is typically larger, with more yellow and a blush of red. Over the years, the columbines in my gardens have hybridized and I’m delighted with nature’s improvisations. 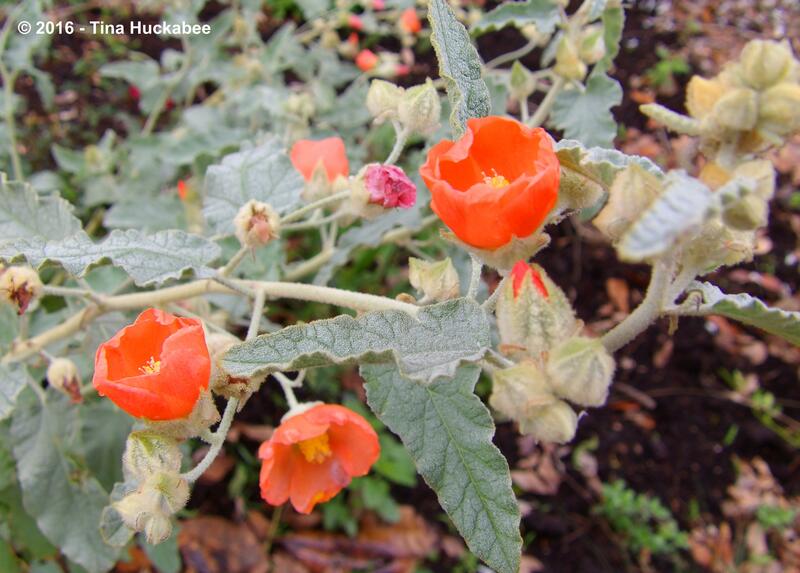 Globe Mallow, Sphaeralcea ambigua, is also open for business, awaiting interviews from native bees. 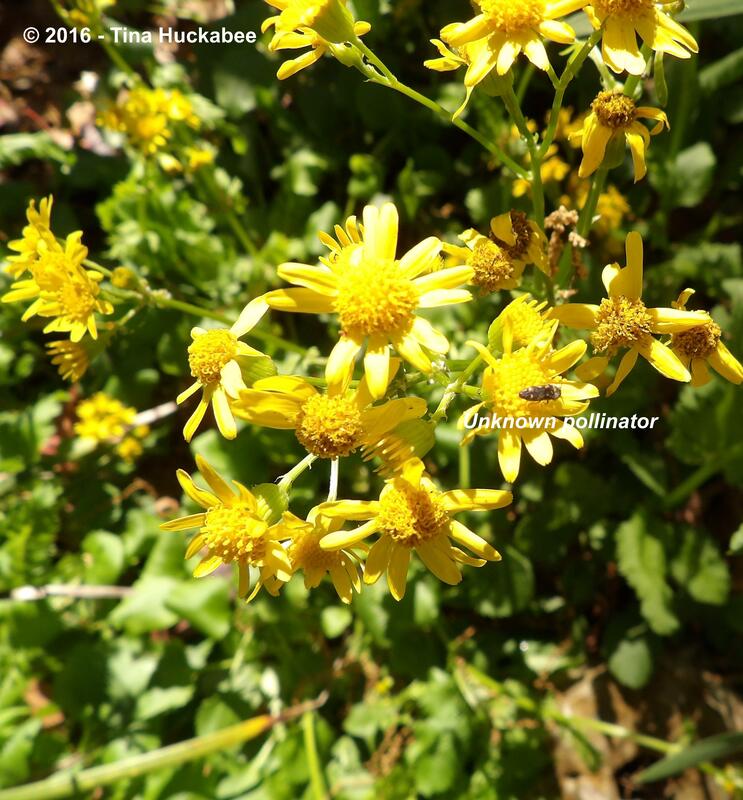 So far, it’s been teeny, tiny bees, too fast for this photographer to capture with any competence. 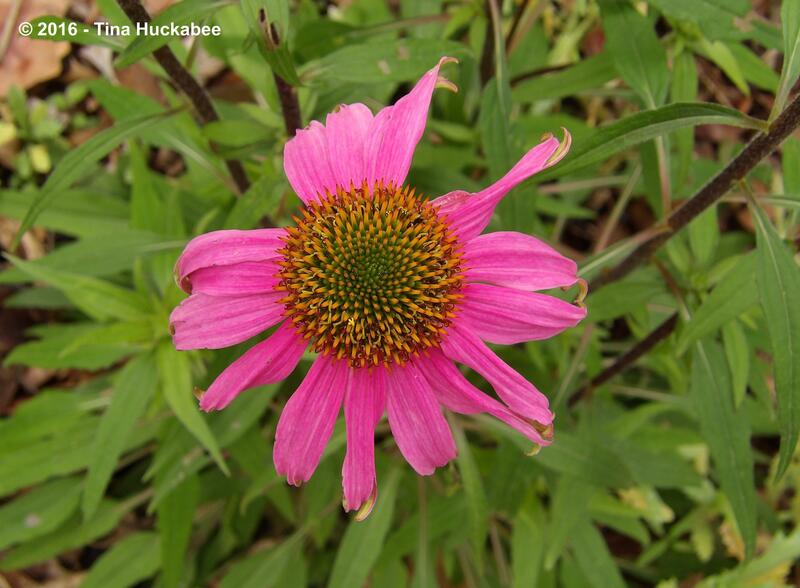 The first blooms of many-to-come Purple Coneflower, Echinacea purpurea, have unfurled their pinky-purple glory, welcoming spring and their lengthy growing season. Another first is with this Brazos Blackberry bloom, which heralds more of the same. 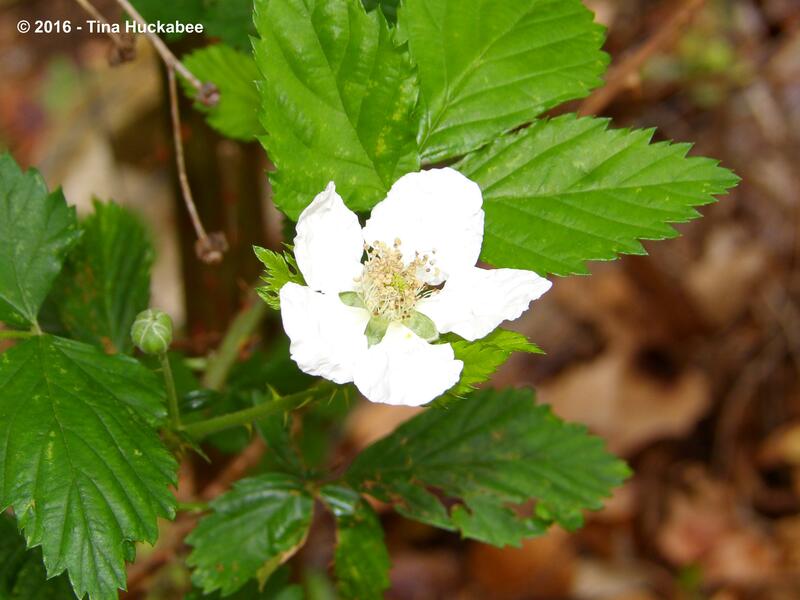 Once those flowers are spent, berries will not be far behind. Yum! I can taste the blackberries now–as well as the blackberry cobbler. Bring’em, blooms! 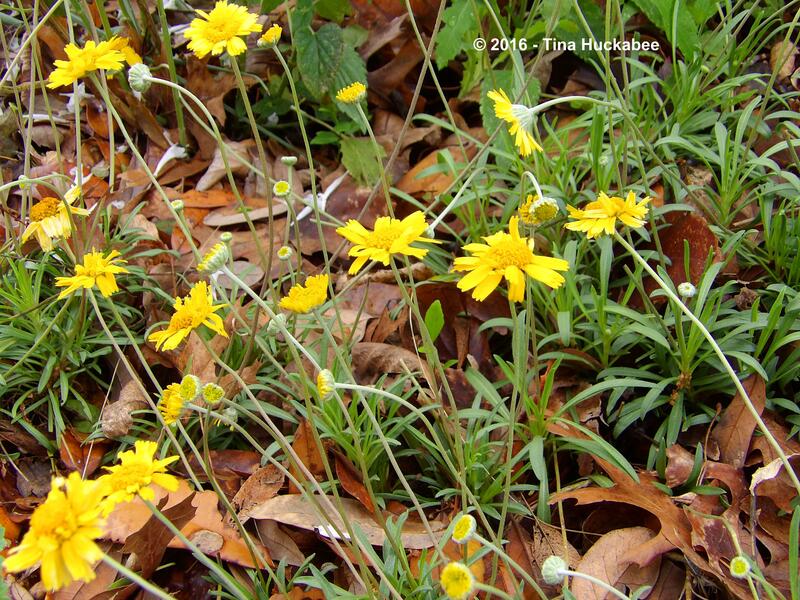 Dancing at the ends of slender bloom stalks all winter and continuing their performance in the spring breezes, the cheery, bouncy Four-nerve Daisy (Hymenoxys), Tetraneuris scaposa, flowers are nearly non-stop bloomers. Tired of these tidy, singleton blooms? How about this cascade of Blackfoot Daisy, Melampodium leucanthum. A tough Texas native that is best when growing out of poor soil or rock, this one is content and flowering in my Green Tower, which is where I grow veggies and most of my herbs. 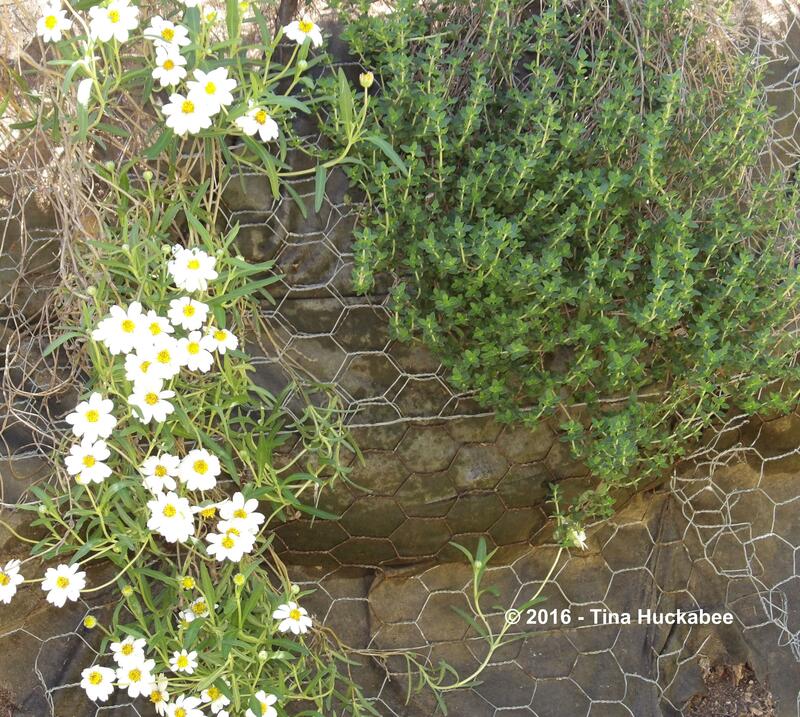 The Blackfoot Daisy buddies-up to a thyme plant which also flourishes in the Tower. 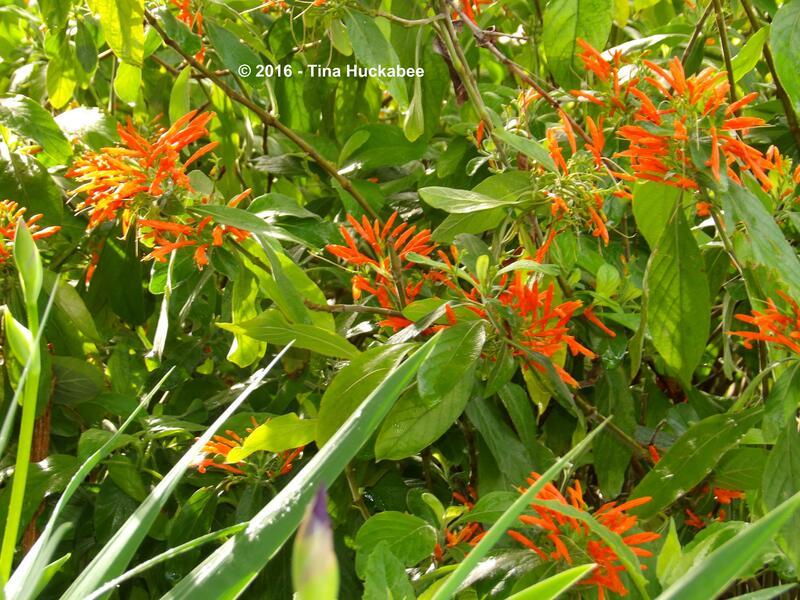 Due to the non-winter this year, Mexican Honeysuckle, Justicia spicigera, wasn’t freeze-knocked to the the ground and thus is blooming with orange abandon this early spring. 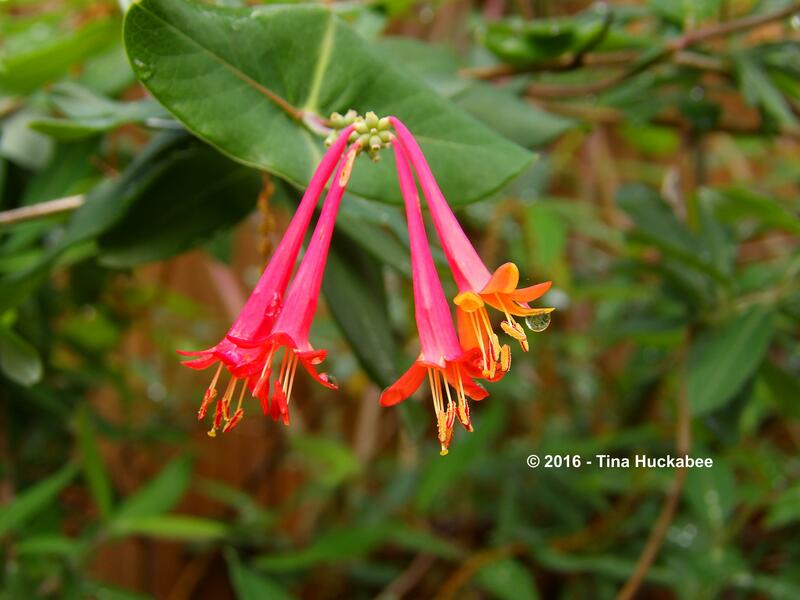 Mexican Honeysuckle boasts constant pollinator activity, especially from a variety of bees. Horsefly-like Carpenter Bee (Xylocopa tabaniformis) works the Mexican Honeysuckle flowers. There are too many blooms and not enough time to showcase them all–they’ll just have to participate in another parade! Thanking Carol at May Dreams Garden for hosting this monthly bloom frenzy known as Garden Bloggers’ Bloom Day. 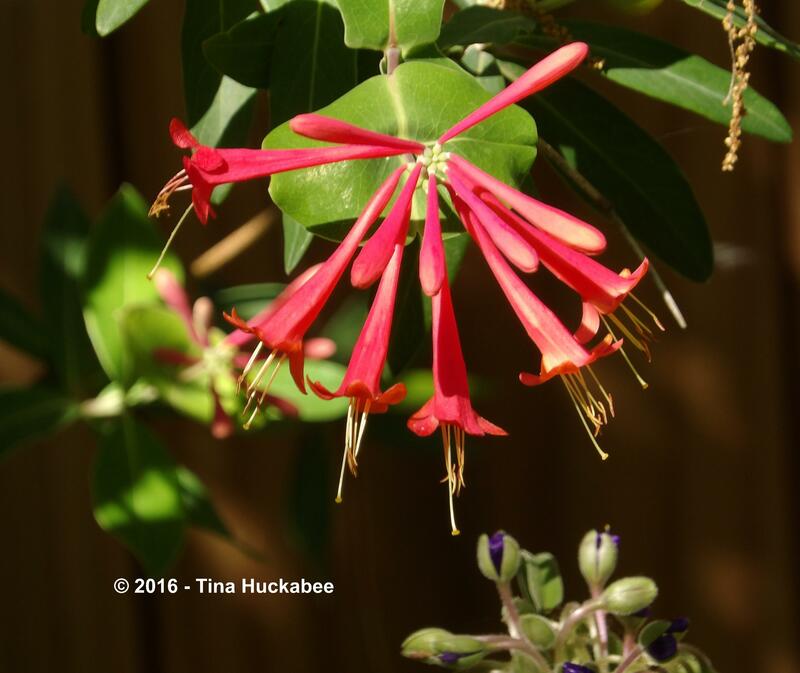 Share your garden pretties, then click over to her lovely blog to see and learn about blooms from many places. 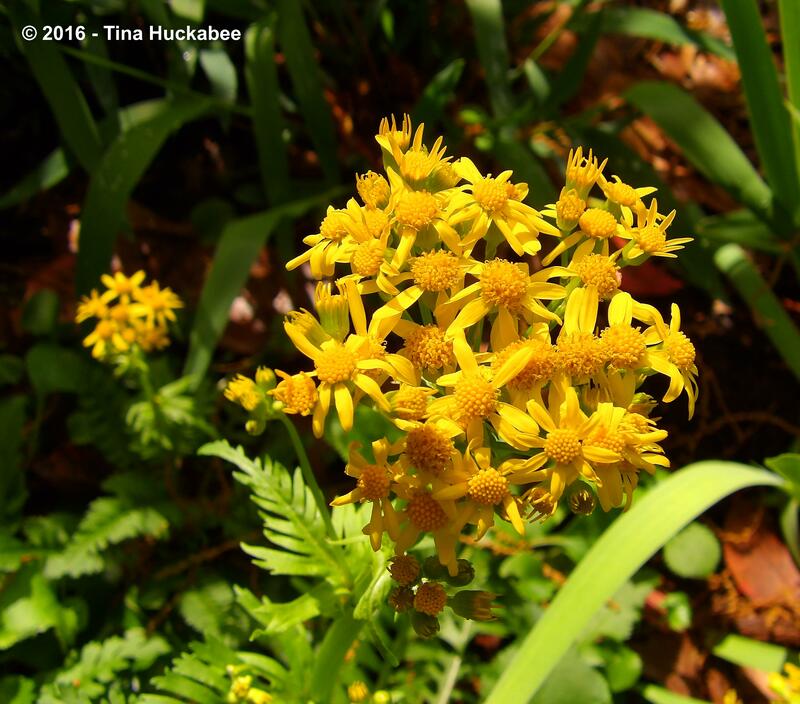 This entry was posted in Blackfoot Daisy, Coral Honeysuckle, Four-nerve Daisy, Globe mallow, Golden Groundsel, Hymenoxys, Mexican Honeysuckle, Purple coneflower, Spiderwort, Texas Columbine, Yellow Columbine and tagged Garden Bloggers' Bloom Day by Tina. Bookmark the permalink. Texas in Springtime is the best. You are a bit ahead of me with some of your blooms. I did see lots of Bluebonnets last weekend out towards San Antonio. Happy Spring! We do host a lovely spring, don’t we? The patches of bluebonnets I’ve seen are all in Austin–haven’t been out of town to know how the blue show is coming along. So much to love here and I’m happy to read you are seeing a lot of bees, albeit tiny ones in the highest numbers it appears. I stay indoors more than I like during this oak pollen season so I don’t really note those teeny-tinies from afar. Even corrected, my vision’s not that sharp! I am seeing butterflies in growing numbers however and that’s always a happy occurrence. Happy March, hooray for the rain we got and double hooray our temperatures are backing down from yesterday and today’s highs in the 90’s. Too soon for the torpid stuff I say…too soon! 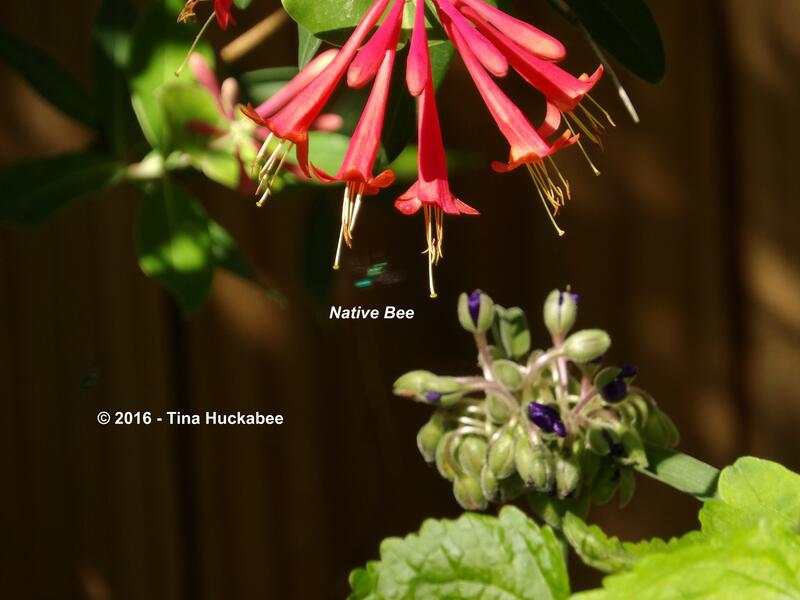 I’m so pleased that there are multitudes of native bees working in my gardens! Have there always been so many and I just didn’t notice? Either way, they’re a treat to behold. Like you, I’m also seeing more early butterflies than usual (a Monarch, just a bit ago!). Yes, we’re certainly starting off with the warm sooner than I’d prefer. Remembering 2011…. Absolutely gorgeous…such a delight are the spring flowers especially the columbine. The columbines just shout SPRING! 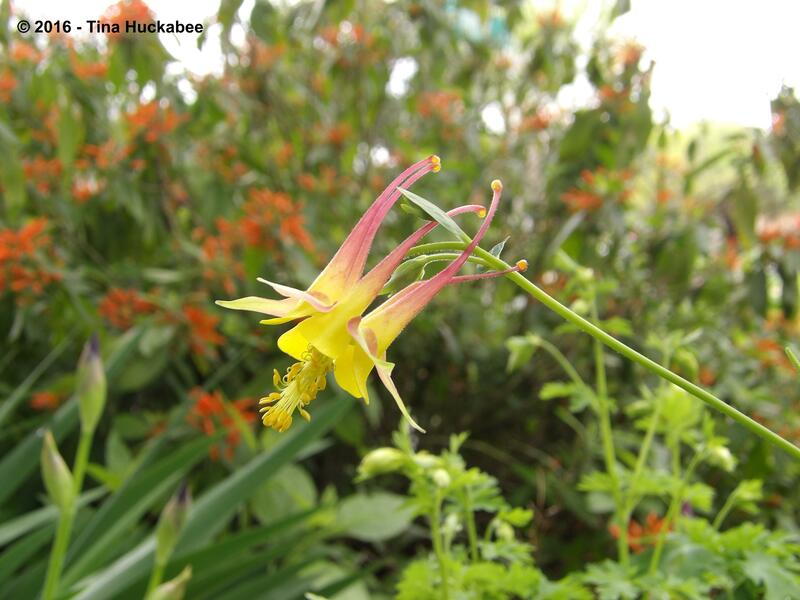 All are beautiful, but the Columbines are really special! 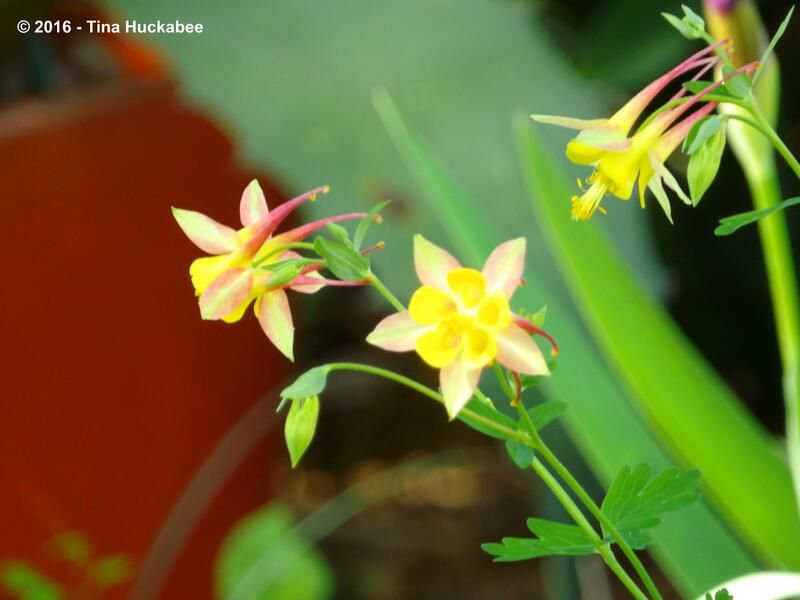 Thanks, Lea–the columbines are special. Happy blooms and spring to you! 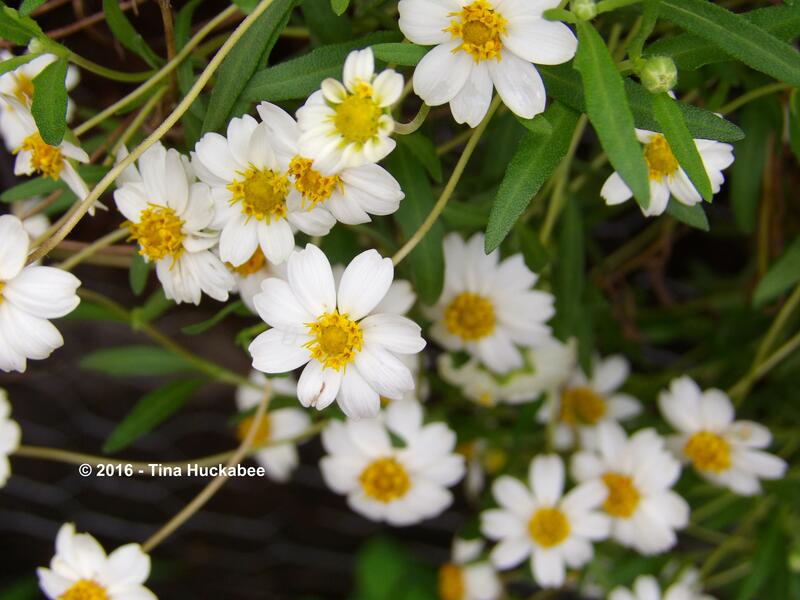 You have so many beautiful flowers in bloom Tina and your photos are filled with sunshine, could you send a little over here please! Trust me, Julie, a little sunshine goes a long way! It’s been SO HOT here (90F, 32C)–you don’t want that in March! I know you’re longing for spring, but it’ll arrive soon!! We’ll cool off tonight–thank goodness! Wow, 32c in March, that is hot. No wonder your dog digs holes in the shade! I may take some time to recover from seeing Echinacea in flower in spring! How wonderful! It is so heartening to see so many glorious pollinator friendly plants. I look forward to the next parade! Ha ha! The Cones are just starting up and will be in full glory in the next couple of months. Yes, lots of yummies for the pollinators in my garden. Lovely flowers! 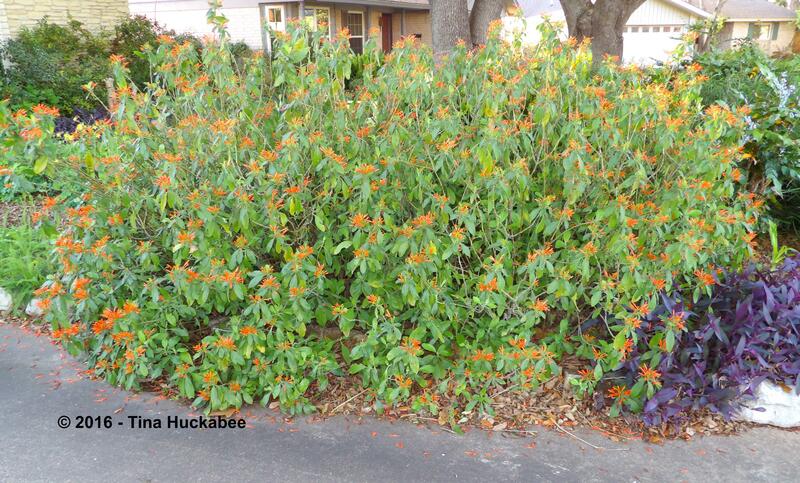 Seeing the photo of your Mexican honeysuckle makes me think we didn’t give ours nearly enough room. Mine is *hyuuuge*–to paraphrase The Bern. Honestly, I’m not sure I’ve ever seen one quite as big, except at Zilker Botanical Garden, where I used to work. That one was a biggy too. Very well said – giddy celebration 🙂 I understand you. 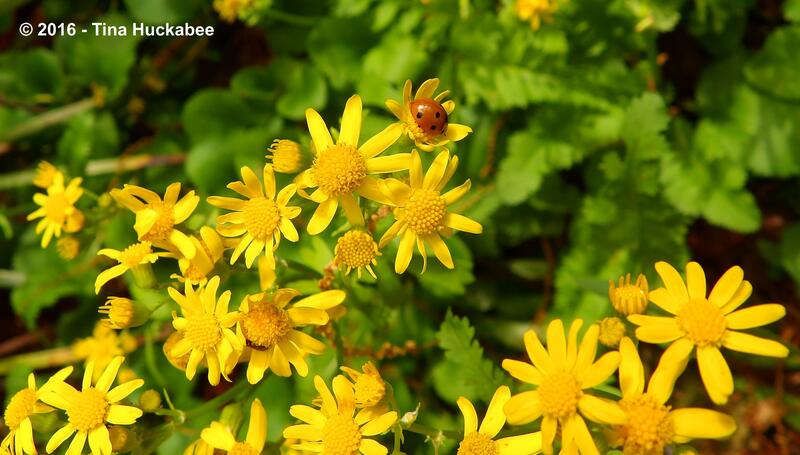 Spring is full of merriment–of all sorts! Many lovelies to enjoy in your garden today. Totally incredulous that your Echinacea is flowering, mine is hardly through the the surface of the soil! Ha! They’re just getting started and will be at the end of their spring blooming season when yours are at their finest. Mine will go (somewhat) dormant in mid-late summer, then enjoy a resurgence in fall. Goodness, it looks like summer in your garden with so much lovely colour. What a wonderful display! Thanks! After a non-winter, we have even more in bloom than would be normal. I’m not complaining! A dribble of rain and the flowers explode. This year I am all about the dewberries. Completely smitten. Explode is right. You have good taste to be smitten with dewberries–beautiful AND yummy!